Mountain bikers should have at least one pair of mountain bike gloves. If you take a look at professionals or experienced riders, you will notice the gloves on their hands. Whether you’re a beginner or not, hand protection is something you can’t overlook. Cycling companies took the initiative to produce these gloves to protect your hands. If you cycle more than a few hours per week, you will need gloves. There are several brands of cycling gloves out there to make your work easier. 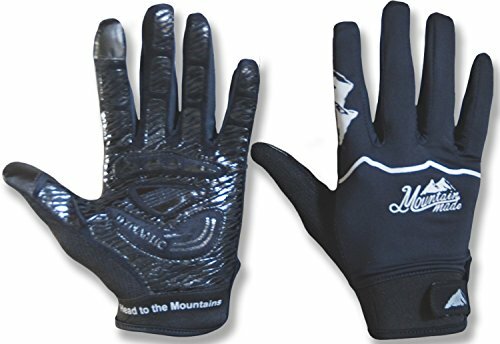 I have shortlisted best mountain bike gloves that we know to be the top cycling gloves on the market. These half-finger cycling gloves have a neat, comfortable design that works perfectly for both men and women. Due to the light, highly elastic lycra fabric and the flexible mash fabrics the gloves are breathable and quick-drying to make a ride in the summer comfortable and airy. They have a conveniently placed soft wiping surface on the thumb. The 3-zone foam padding installed in them makes them ideal for absorbing shock and preventing slip. The padding material is strategically placed in those areas of the hand that has been scientifically proven to take the most excitement during cycling. Whether it is a rugged terrain or from stunt performed, the gloves reduce the blow that would have otherwise gone directly through your arm. The gloves have been made easy to remove by installing finger pulls. As simple as they are to put on and tighten using a Velcro wrist closure they are designed to come off as simply. They understand that struggling to remove gloves is something no one enjoys. The elastic lycra fabric ensures there is maximum flexibility for your fingers to allow proper blood circulation while the padding and light fabric help reduce numbness on a bumpy surface efficiently. A sticky Velcro buckle is fitted to prevent slip and also make them quick drying for a more relaxed ride. The fingers are strategically left free to allow you to have a firm grip on your handlebars. This is one of the many products by Troy Lee Designs. 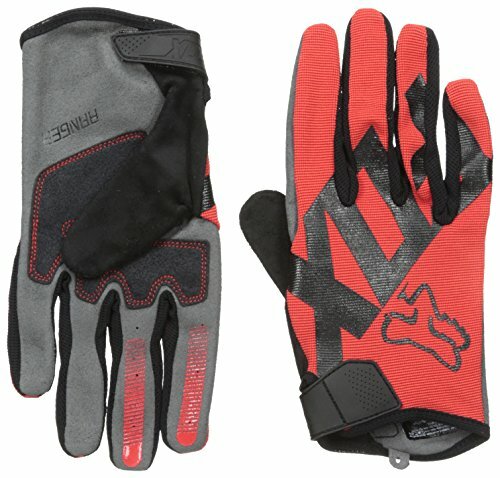 It has certain features that make it suitable for use as mountain bike gloves. In addition, it would be good also to highlight its unique features. They come in the different type of colors and sizes depending on your choice. The materials made from are Lycra fabric and mesh to allow room for breathing and ventilation. The top is made up of the clarion synthetic fabric. It features an absorbent micro-suede thumb which aids in minimizing moisture accumulation in a rider’s hands due to sweating which may otherwise lead to quite an uncomfortable grip. 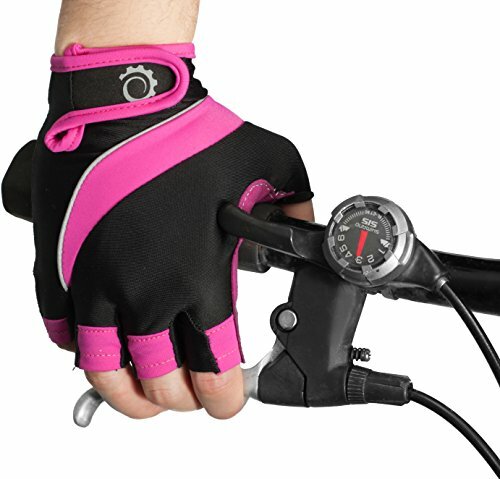 It is also made up of a lightweight flexible a blend of polyester and mesh which ensures that there is no extra unwanted mass between the hand and the handlebars. This may because of unease for the rider. The flexibility also ensures that there is no restriction of movements made by the hand. The double layer clarion palm provides re palming for protective purposes. It is also featured with a silicone grip fingertip to enable a firm grip on the handlebars. A firm is very essential in cycling as it provides optimum maneuvering hence preventing any unnecessary incidents or dangerous accidents. The low profile wrist tab closure reduces any arising post-traumatic wrist pain. This is a feature that is quite helpful in the aftermath of riding which minimizes the negative physical after-effects of cycling on your wrist. 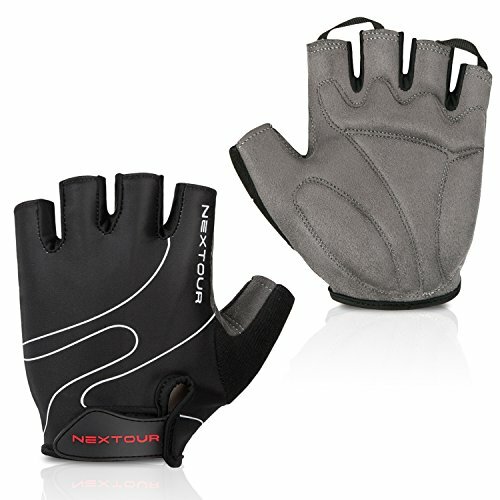 They are recommended to be used by mountain bikers during biking to ease fatigue and reduce risks of hand losing grip. The NEXTOUR also have a say in the mountain bike accessory production. As attested to by its name these gloves provide a remedy for the grievances faced in wearing gloves during such heated conditions such as the summer; owing to its half- fingered feature. The gloves are half fingered to provide aeration and thus a cooling effect. They have high ventilation made of the perforated materials. They are made of elastic fabric and Lycra together with the elastic mesh fabric. Lycra fabric ensures the flexibility of the fingers to move freely. The Anti-slip Pad and the durable fabrics help in reducing and ease the numbness of the fingers when riding a good mountain bike together with the fatigue of the body. They are soft with a low profile on the fingers for the wiping surface of the sweat on the face. They are very resistant to prevent slipping off the arm. They quickly dry when washed and when sweat on is cozy and soft for comfortable handling on the handle. The forefingers are free to good handling grip on the handlebars. The gloves are much easy to remove a much convenient way. The finger can pull far easily along to the wrist which is fit a good closure. The palm is padded and also made for shock absorbing. They greatly alleviate the vibration on a bumpy road for protection mostly during training and racing. The gloves come in different sizes that allow you to get that which best suits you. For those fitness enthusiasts, the gloves can be used for more than just riding but also for weightlifting and other hand based exercises. There is also a towel cloth attached to the thumb whose purpose is to swab sweat. The finger loops present to make the gloves easy to operate that is in putting on and taking off. This easy access can be quite the time saver. It has a hook and loop closure system. This feature serves to provide a firmness that prevents slipping of the gloves from the hand which has already established is quite essential for the riding process. These gloves are light but efficient in the job they are required to do. They are full gloves with covered fingers. The gloves are not bulky at all and have enough padding to be both comfortable and protective. Due to their light nature, they are convenient even for those people who do not like wearing gloves. They are made of 50% polyamide nylon/ 10% polyvinyl chloride/ 40% polyester. They have an absorbent micro-suede thumb that is conducive to wiping trickling sweat. They have a light, flexible top hand that makes them much more fitting and comfortable. The double layer clarion palm allows better grip and reduces the wear and tear time of the gloves. The double clarion layer offers protection to the palm during the hard grips when cycling. P.S. Don’t forget to check out our Best Mountain Bike Grips – Which One Should You Choose? Guide. It has silicon grip fingertips that make the gripping of the handlebars that much more efficient. They prevent the fingers from being sore due to gripping and movement during riding. The glove’s silicon fingertips work well on touchscreen phones once heated by your body. Unlike those bands that keep you guessing about the size, fox racing ranger gloves have an excellent standard sizing that ensures you can select the perfect size for yourself. For mild and hot weather these gloves will serve you ideally. They are breathable and keep your hand dry and comfortable. It is easy on and off the glove and is definitely worth the money. The Aloith star half finger gloves are well made with a gel padding that provides maximum cushioning from shock as you ride your bicycle. They eliminate the vibrations that you would usually feel when riding. The glove has four-point padding which is located at the bottom of the fingers, the base of the thumb, the outside part of the palm and the triangle left in between. The strategic design allows maximum comfort when gripping down on the handlebars. This model is so comfortable that many use it for more than just cycling. The design of the gloves makes them feel very comfortable on the hands. The soft edges of the glove’s half fingers are softened and hence do not leave your fingers sore. The loops set on the gloves allow ease in taking them off; that is very convenient. Part of the glove is made of a beautiful weave that gives an almost shiny finish. The breathable upper side lycra material which is stretchable and light. The thumb has a soft cloth that is convenient for wiping sweat. To fasten the glove a hook and loop closure is most convenient for the tight but comfortable. The palm part of the glove is made of durable synthetic leather. This design choice gives the glove a very long lifespan in tip-top condition. Conveniently, these gloves are in proper sync with the standard measuring chart and fit consumers perfectly as expected. Wearing gloves when riding makes the experience more comfortable. Your hands are protected from unwanted sores as well as the long-term effect shock has on the body. If you genuinely enjoy cycling then get yourself the best cycling gloves will surely make your experience better. Some of the reasons why gloves are so important are the facts that fall are unpredictable, you need to prevent hand numbness, and good grip on the handlebars is vital. One of the things makes these the best cycling gloves is the design. It is simple, stylish, elegant, and serves the purpose. These manufacturers have performed numerous tests to find the need for the day to day cyclist. They have noticed a significant health difference between those who use gloves and those who do not. The gloves undoubtedly have a positive impact on the general health of the cyclist. Enjoy a good outdoors day with your loved one in real comfort. Make after-sores a thing of the past by using these gloves. Choose the best and enjoy the tender care that these products offer. A distinctive feature of this pair is the touchscreen inputted. This feature enables one to actually operate a touchscreen device without having to take off the gloves; it eliminates the tedious activity of removing and re-wearing of gloves. It is made suitable for the pre-spring. 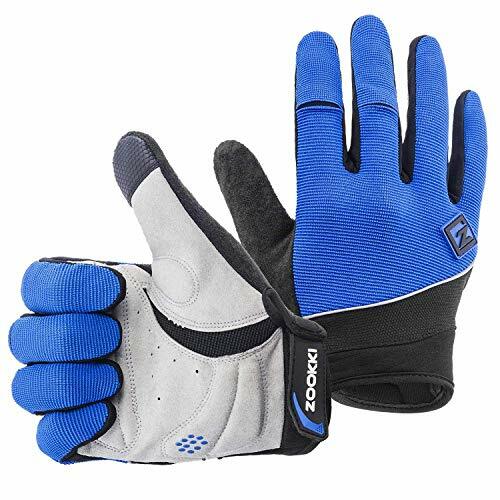 It has a lightweight minimalist cycling glove which not only helps in improving its fit but also in breathability to keep the inside of the glove in a cool state. The lycra backing also enhances the breathability. It has a velcro strap which makes the wearing and removal of the glove quite simple. The Velcro strap is also durable and in addition to that provides a comfortable fitting that doesn’t slip. This glove is also featured to operate like a chameleon to adapt to varying temperatures; its breathability makes it suitable for the warmer temperatures and still being full-fingered provides redress to the harshness of the colder temperatures. Mountain Made provides customizing options for these gloves which enables one to enjoy an almost perfect fit. 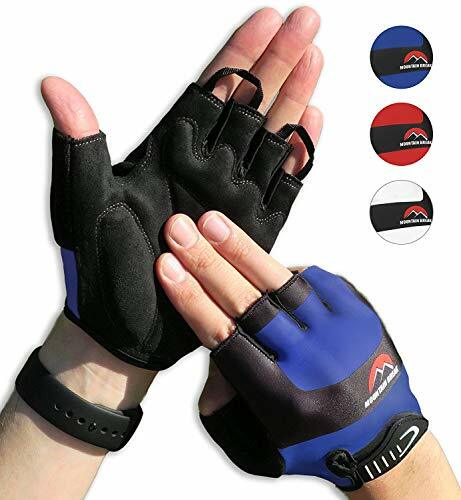 These gloves are not only suitable for use with mountain bikes but can also be applied in activities such as gardening, frisbee throwing, evening walks, and the list goes on. They are mountain racing bikes gloves. Bike racers can also use them during racers. The gloves are also touched recognizable. They are made of elastic fabric and microfiber leather for hard wearing and great fit. They are designed especially for the provision of comfortable compression for all the sports racers and sports lovers. They are also special with the touch recognition with a tailor in three-dimensional ways. They help it easy in touching smart-phone and all touchable electronics. The fabric of the palm is skip-proof and is of hard wearing. They are specially thickened at the palm pad to absorb the shock and help reduce numbness on a bumpy road. The silica pad act as buffer layers to ease the palm fatigue. They also help in reducing the probability of the hand from slipping away from the handle. They are made of the mesh cloth which is perforated to moisture-wicking and for excellent ventilation. The thumbs are designed with terry cloth for used in wiping and distracting the sweats rather than wiping the whole of the face. GearTop gloves major on an ergonomic featuring. This is attributed to its added cushion pads which form a sort of comfortable protective barrier between the hands and the handlebars. This protective barrier reduces fatigue and discomfort in the hands and effect minimizing blistering from any rubbing friction during riding. 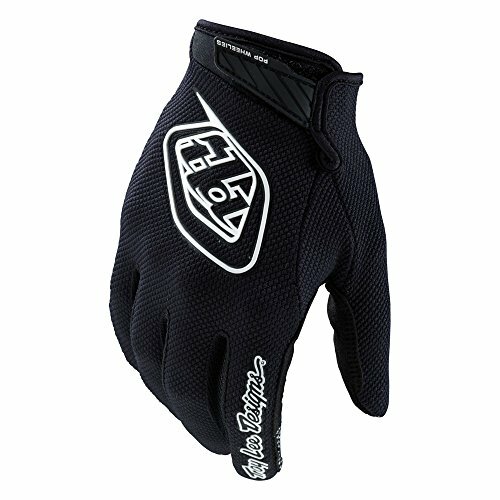 It has a vent hold in the middle of the palm ensuring good air circulation which provides for the breathability aspect. Also, it is made of a quick drying material which minimizes the sweat accumulation. This is important in keeping the hand free of any uncomfortable moisture which may in eventuality even lead to slipping incidents. There is a velcro wrist strap which enables one to adjust the tightness of the gloves hence preventing any slipping. The gloves have the added feature of bright and illuminating colors to enhance a rider’s visibility, especially for cycling in darker hours. The gloves have been made to adapt to varying weather conditions and can thus endure rain or other moist situation. The backhand of the glove is made of performance stretch lycra panels that contribute to a high flexibility aspect leading to comfortability. Do you enjoy mountain biking? Do you aspire to go for mountain biking? If yes, then your best bet is to get everything ready. Once you have your mountain bike ready, there are some few things to get. On top of your list are mountain bike gloves. Mountain bike gloves not only protect you from the weather but also sores and blisters. Not to mention shielding your hands in case of a fall. As if that is not enough, mountain bike gloves will give you a better grip when climbing up and down the mountain. It is not enough to have mountain bike gloves; you need to have the right ones. With the right gloves, you can enjoy a smooth ride free of problems and injuries. Here are some of the things to look at before buying your gloves. The type of whether you are riding on will determine the kind of gloves to go for. Winter gloves are thicker, warmer and waterproof, while summer gloves are lighter and breathable. The ability of the gloves to allow water vapor to escape is called breathability. While less or non-breathable gloves stock moisture inside your hands, more breathable gloves allow more moisture to get out keeping your hands at optimum temperatures. Even if gloves are meant to protect your hands during cycling, different gloves offer different levels of protection. Some gloves are intended to protect your finger and palms in case you fall, while others can provide extra protection, even if you crash. Keeping your hands dry during a ride is essential. You don’t want to lose your grip when going uphill or downhill. Gloves that are waterproof will keep your hands dry during arid. Remember to consider this factor together for breathability. This will help you choose gloves that wouldn’t fail you in any weather condition. The grip is what you need to enjoy that ride. Sliding of fingers can cause falls and injuries. While gloves are meant to improve your grip, some of them have extra silicone grippers to increase the general grip. Grip is extremely important when biking. Warmth may increase or decrease your comfort depending on the weather. Knowing how warm your prospective mountain bike gloves can be a big boost. If gloves are too warm, you may want to avoid them during the summer. More heated gloves are comfortable during winter due to cold conditions. Whatever the type of the glove you choose, the most important thing to think about is the fit. Buying high-quality and relevant gloves that don’t fit is the wrong decision. If you can purchase consistent, high-quality and fitting gloves, you’ll be on your way to a smooth and enjoyable ride. Without gloves, your ride will be injury plagued and less pleasurable experience. With mountain bike gloves, you’re sure of enjoying your ride in different weather conditions. Wherever whenever you ride, ensure that your gloves are with you at all times. Bear in mind that mountain bike gloves enhance your safety. You shouldn’t entirely rely on them for protection. Other factors such as clothing, the quality, and condition of your affordable bike and your riding experience will all play a role in your safety. Making a decision can be difficult. 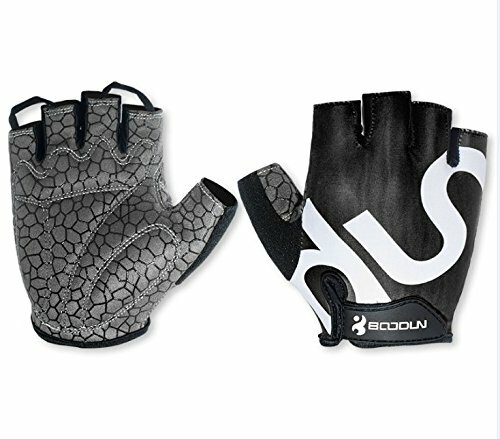 Having singled out the best mountain bike gloves, we have made your job a little bit easier.